Relive Demo Factor 2018 as it happened with our live blog. 23:30 – That’s all from us here at Demo Factor 2018. Congratulations if you had your demo played but fear not if you didn’t, the judges have said they will listen to all of the demos and give feedback. 23:25 – After long deliberation and lots of filling by our host Ben Burrell, the judges have decided who has won Demo Factor 2018… IT’S TOM HINCKLEY FROM SHOCK RADIO! 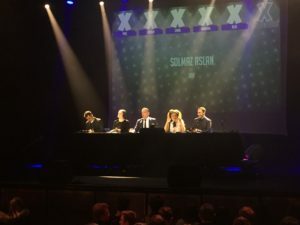 23:21 – The judges are now deliberating! Who is your Demo Factor winner 2018? 23:16 – The final demo of the night is Jake from CSR. Could he win? Jordan said he’s so relatable and made a smile on his face and he golden buzzer-ed him! 23:11 – Becky from Xpression FM lasted the full minute because Jordan didn’t buzz. Paul said she needed to be more authentic and get across more personality! “That was boring but you’re not boring”. 23:08 – Jocelin from BBC Radio 1 just golden buzzer-ed Stephen from Smoke Radio!! She felt he was so relatable and had a great voice. Let’s work on content and then we could do something amazing. Jordan said he loved him!! 22:05 – Jocelin thought Leanne’s from DemonFM demo was a bit too specific to Leicester so she felt alienated. However, she did say that isn’t necessarily a bad thing. Paul and Chris thought she needed more personality! 23:04 – There are only ten minutes left of demos!! 23:01 – Pandora thought Megan from NSR is so relatable and thinks if she had her best stuff at the start of her demo, she would have had a golden buzzer! 22:55 – Harry Benjamin from Livewire, Chris North is proud of you! Well done for nailing the SRA Chart in return here’s a golden buzzer!! 22:53 – Finally it’s working! Chris said he wasn’t getting anything from Meg from Xpress Radio’s demo. Jordan said if she has another year in student radio she could be incredible!! 22:51 – Before we start the next demo, head judge Chris North is not happy with how Xpress Radio is uploading their demos. This is the third time one of their demos hasn’t played!! 22:48 – Oh no she didn’t!! (she actually did) Kaylee Golding from Shock Radio just got a golden buzzer from Paul!! Paul said you are never going to work on my radio station but you are brilliant!! I think you are the future of BBC Radio 1. Aled thinks with a good producer you could pilot with 1Xtra!!! 22:12 – Edmund from Spark Sunderland managed to survive the minute. Jordan said he has brilliant energy and his use of different pieces of audio made the listener feel part of the link. Then he dabbed and began unpopular amongst the audience… Rookie error Edmund. 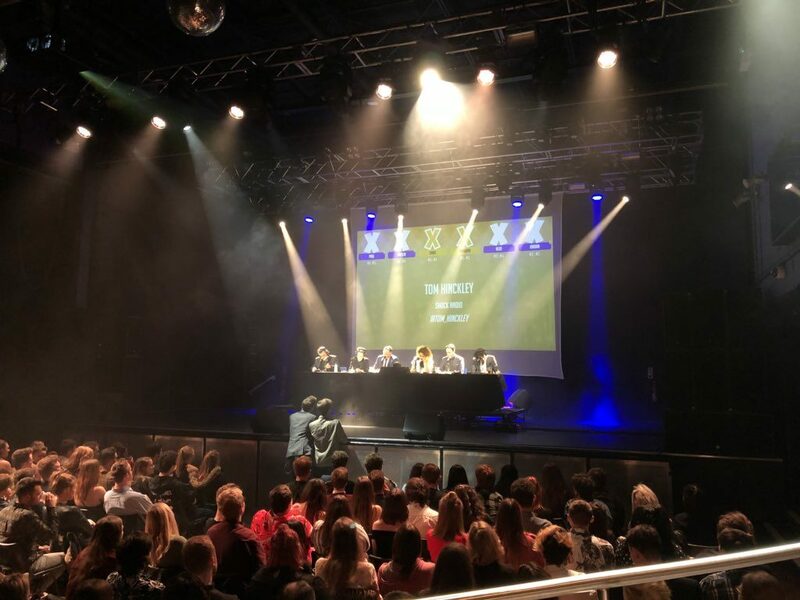 22:07 – Tom Hinckley from Shock Radio is the second GOLDEN BUZZER of the night! He had 2 golden buzzers from Chris & Pandora and THEN A STANDING OVATION from all of the judges!! Pandora said ‘babe you’ve got a job in radio’. Chris North said he is SO gutted that Pandora hit the golden buzzer before him! Jordan North said he’s the best demo of the night by far. 22:01 – Jocelin ‘absolutely loves’ Sarah from Boom Radio’s voice and was so gutted that it had to stop at one minute. 21:57 – This year’s guest judge is Jordan North! 21:56 – The judges are back on stage for the second part of Demo Factor. So far it’s between Gregor and Kerrie. 21:33 – Jocelin listened to the whole minute of Michael from Xpress Radio’s demo but she didn’t like his David Attenborough impression/ she didn’t know who the hell it was supposed to be. Paul was very intrigued… ‘It was like Homeland, I wasn’t enjoying it but I was compelled to listen to it’. 21:30 – Jocelin from BBC Radio 1 is just very confused with Tristan’s demo from Surge. Pandora didn’t put it as nicely as that and described it as boring, but she thinks he has potential. Good try Tristan. 21:24 -WOW OUR FIRST GOLDEN BUZZER!! The rest of the judges buzzed early but Aled from BBC Radio 1 pressed his golden buzzer for Kerrie Coshan from Fly FM! Aled said she could be Charlie Sloth’s co-host. 21:19 – Adam Wood from Spark Sunderland is a popular man amongst the judges. Paul “Who doesn’t want to hear about sausage at lunchtime”. He said he was very close to golden buzzer-ing (if that’s a word) but just need alittle more from Adam. 21:15 – Megan Hornsby from Shock Radio is up next. Paul thought she was good and had potential but her demo was well… we can’t type the word he said. Megan was very proud of lasting as long as she did. 21:11 – Gregor Davidson from City Radio Glasgow was the first entrant who survived the whole minute! Pandora absolutely loved Greg’s demo and said she wanted to hear more but she didn’t press the golden buzzer. 21:09 – Up first we have Solmaz Aslan from URF in the South East. The judge’s response wasn’t great… they didn’t realise she was playing a character so they buzzed early. Aled said now he knows it was a comedy demo, he quite liked it but would slightly tweak it before sending it out to Programme Controllers.